Rye Farm01206 734350work01206 734370fax Self-cateringIdeal for a relaxing break. Watch the bird life and enjoy a walk in the countryside. A rural location but close enough to Colchester to explore Britain's oldest recorded town. 15 minutes from Mersea Island and 30 minutes from the coast. Abberton wildfowl centre is just 2 miles away. Pondview on the ground floor is a twin bedded apartment with a shower. The lounge, dining room and kitchen are open plan and it does have a view over the pond! Cartlodge also on the ground floor has a king size bed and is suitable for wheelchair access, with a wet room. It has a view towards the moat. It also has an open plan lounge, dining room and kitchen. 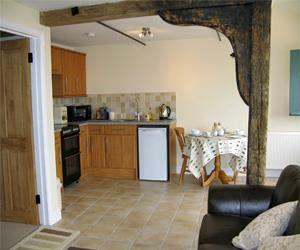 The Granary is upstairs and is suitable for a couple or a small family. It has a bath with an overhead shower. The view from here is over the fields toward the reservoir. The Courtyard stands on its own and has an open plan lounge, dining area and kitchen. There are two twin bedrooms, both en suite. One upstairs has a bath with overhead shower and the one downstairs has a shower. There is dishwasher and laundry room. All bedding and towels are provided. Electricity, heating and washing/drying facilities are included. There is ample parking. Rye Farm is open all year. Ideal for a relaxing break. Watch the bird life and enjoy a walk in the countryside. A rural location but close enough to Colchester to explore Britain's oldest recorded town. 15 minutes from Mersea Island and 30 minutes from the coast. Abberton wildfowl centre is just 2 miles away. Short breaks minimum of 3 nights, subject to availability. We have guests who make many return visits - that says it all! Cycle storage available. Children welcome from age 2. A12 to Colchester. Leave at junction 26. Follow signs to Zoo (picture of elephant). Pass the zoo on the right. Next roundabout follow signs to Layer B1026. Once in village turn left at Fox Tavern, then 300yds on right. Sign to Rye Farm, turn right and follow lane all the way to the end (pass cottages on left).